Starting to think about potty training? If you’re like most of us the thought is a little scary and intimidating, most likely for your toddler as well. A great way to break the ice on this topic is to start with some age appropriate books to read with your toddler. Introducing these books before you start potty training will help your toddler develop a healthy understanding of this big change. Below are a few of our favorites! This cute, lift the flap book is great because it includes the characters that toddlers love – firefighters! Each page introduces a new story and a character who’s story pauses as they use the restroom, reinforcing the idea that everyone uses the potty. This is a great book to start with very young toddlers who enjoy board books and flaps! The silly title encompasses exactly what this book entails. “Everyone Poops” includes the animals toddlers love to recognize like birds, zebras giraffes and even whales! This book will make you and your little one giggle as you think and talk about the differences between a fish poop and a whale poop! “Diapers are not Forever” is part of a series that is a favorite in our program. This book empowers toddlers to use the potty and “do what big kids do” in a way that is fun and engaging. Even better, it has tips from a children’s health specialist included! While reinforcing the idea that everyone poops this book focusses in the correct places that all living things go, like animals and humans. Toddlers can gain confidence knowing they have a spot to go that’s their own! 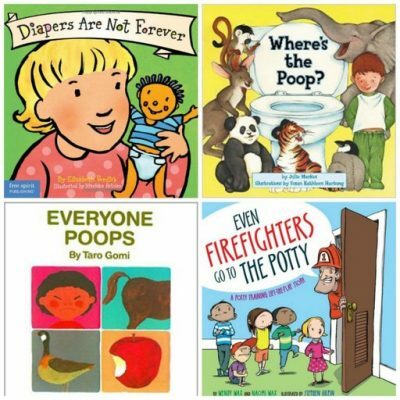 There are so many great books about potty training! Does your family have a favorite?